I hope that everyone who celebrated had a wonderful Thanksgiving! It was great to be home with my family in Connecticut and to see some of my friends from high school I hadn't seen in a while. I have an admission - I don't really love Thanksgiving. I enjoy spending time with family and I like that it centers around giving thanks, but I view the holiday as more of a kick-off to the holiday season, rather than a particular day that I look forward to each year. That being said, there was some pretty stellar food this year at my Uncle's house, including baked ziti with globs of fresh ricotta. Yum. On Saturday night, Pat and I (along with my parents and his parents - a triple date, if you will) saw Fantastic Beasts and Where to Find Them. It was absolutely magical and solidified all of my reasons why I am a Harry Potter fan. I loved seeing the new world J.K. Rowling created and all of the fun (and frightening!) beasts. The Niffler was the cutest. Also Eddie Redmayne can do no wrong in my eyes. It reminded me how a re-reading and re-watching of the entire Harry Potter series is long overdue for me. Perhaps I will complete that over the holidays! This recipe happened kind of randomly - I was in desperate need of groceries but too lazy and cold to go shopping, so I kind of just whipped up some random stuff I had in my kitchen and fridge. Voila, Savory Cornmeal Pancakes are born. They were very delicious though, and a nice alternative from regular pancakes. I topped them with smoked salmon and capers for some salt, and sliced cucumbers for a nice crunch. In a large bowl, combine the flour, cornmeal, baking powder and salt. In a small bowl, whisk the eggs, milk and oil. Add the wet ingredients into the dry and stir until thoroughly mixed. Pour 2-3 tablespoons of batter at a time onto a lightly greased hot griddle to form small pancakes. Turn when bubbles form on top; cook until the second side is golden brown. 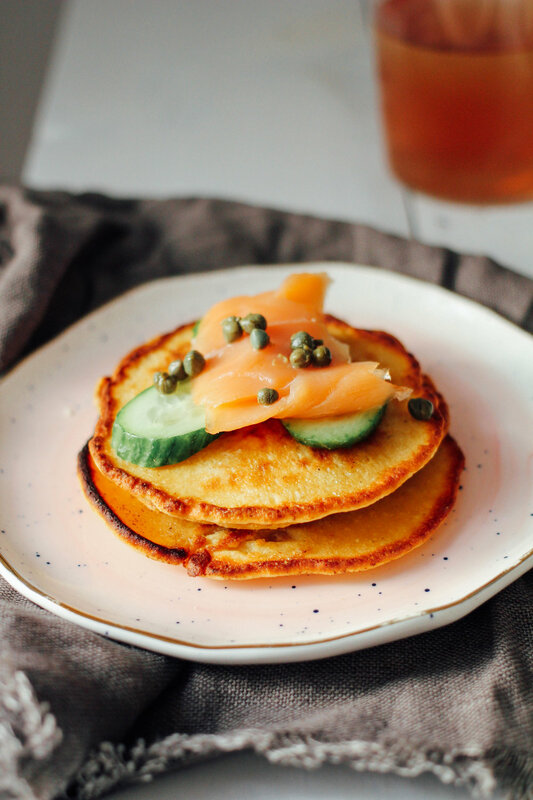 Serve with smoked salmon, capers, and sliced cucumbers.